Newton’s Third Law of Motion states: ‘To every action there is an equal and opposite reaction’. It must be remembered that action and reaction always act on different objects. The Third Law of Motion indicates that when one object exerts a force on another object, the second object instantaneously exerts a force back on the first object. These two forces are always equal in magnitude, but opposite in direction. These forces act on different objects and so they do not cancel each other. Thus, Newton’s Third Law of Motion describes the relationship between the forces of interaction between two objects. Whenever two bodies interact with each other, the force exerted by the first body on the second is called action. 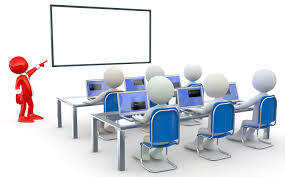 The force exerted by the second body on the first body is called reaction. The action and reaction are equal and opposite. 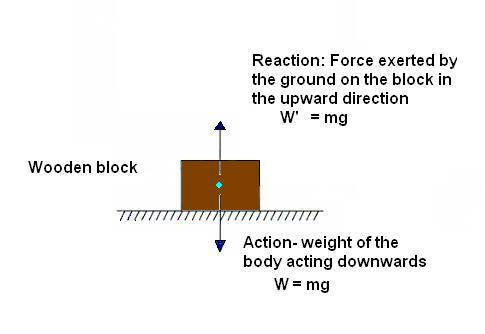 For example, when we placed a wooden block on the ground, this block exerts a force equal to its weight, W = mg acting downwards to the ground. This is the action force. 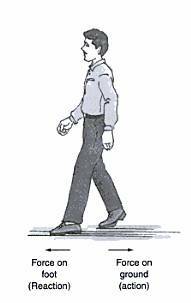 The ground exerts an equal and opposite force W’ = mg on the block in the upward direction. 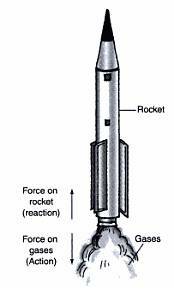 This is the reaction force. 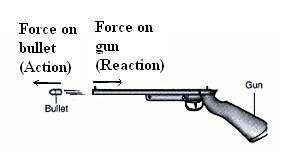 When a bullet is fired from a gun, the gun exerts a force on the bullet in the forward direction. This is the action force. The bullet also exerts an equal force on the gun in the backward direction. This is the reaction force. Due to the large mass of the gun it moves only a little distance backward by giving a jerk at the shoulder of the gunman. The backward movement of the gun is called the recoil of the gun. 1. Take two similar spring balances of different ranges, say A and B. 2. Note the least count of the spring balances. 3. Attach the ring of spring balance A on a hook fixed in the wall and the spring balance B is attached to the hook of spring balance A. 4. Hold the spring balances exactly horizontal to the table. 5. Pull the ring of spring balance B gently. 6. Observe and note the reading of both the spring balances.Repeat the experiment by applying different forces. The readings on both the balances are the same in each case. 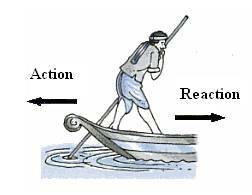 Thus action and reaction forces are equal and opposite and act on two different bodies. 1. Spring balance of different least count should be taken. 2. The spring balance should be brought in elastic mode before doing the experiment. 3. The second spring balance should not be pulled beyond its elastic limit. 4. The reading of the spring balance should be taken without any parallax error.